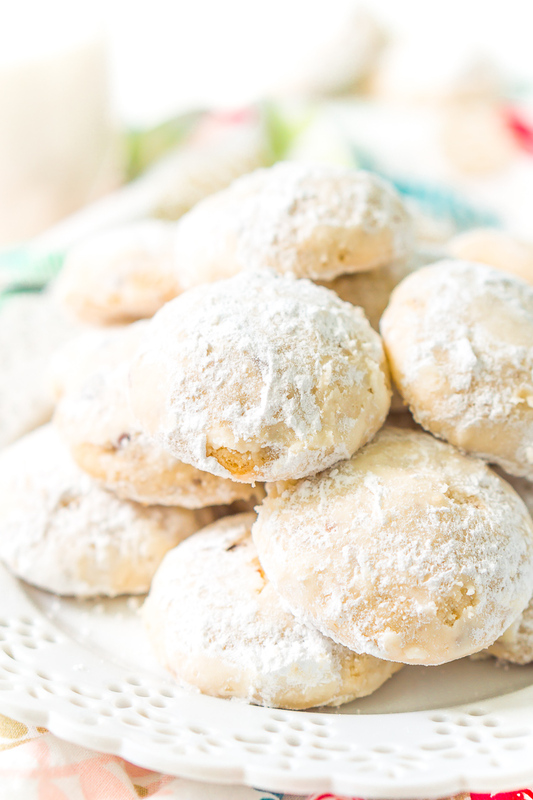 Snowball Cookies are a classic and a staple at holiday cookie exchanges. Made with butter, flour, sugar, vanilla, and chopped pecans, they’re a delicious and addictive dessert! 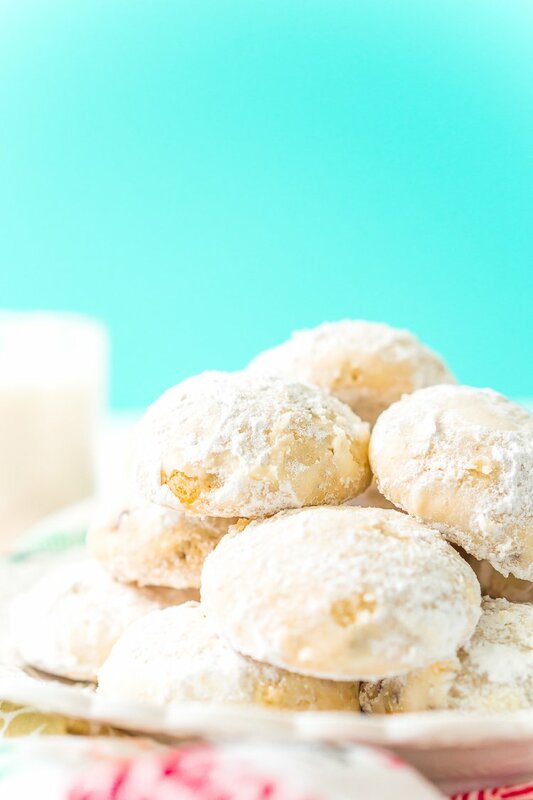 Whether or not you actually like the snow, I promise you’ll love these classic Snowball Cookies! Made with a few simple ingredients, you can bake and share these nostalgic treats from now throughout the holiday season. If you have memories of munching these goodies in your childhood, you’re certainly not alone! Snowball Cookies are actually made all over the world. 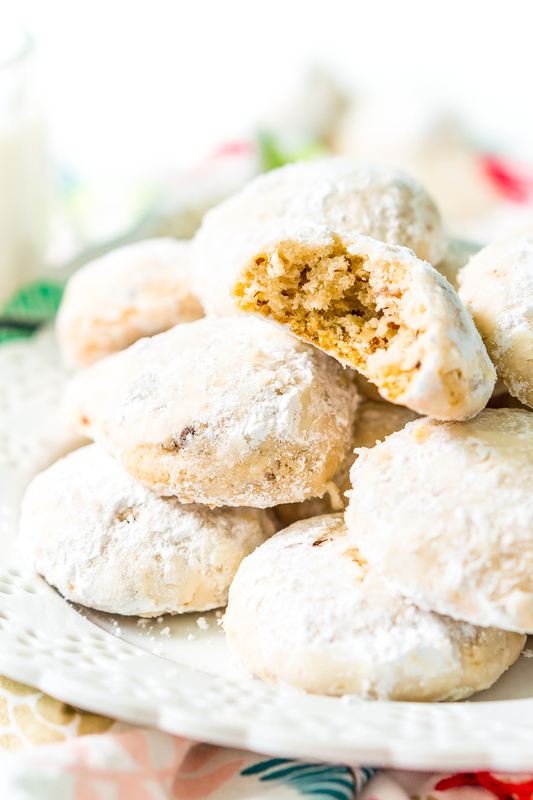 They’re known by many different names, including Mexican Wedding Cookies, Italian Wedding Cookies, and Russian Tea Cakes. And it’s no wonder they’re so popular. These pretty treats are easy to make, requiring only seven ingredients: butter, sugar, salt, vanilla, flour, pecans, and powdered sugar. 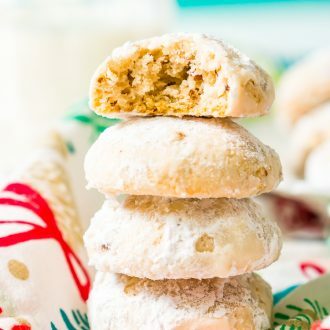 This particular Snowball Cookies Recipe is the version that’s popular here in New England. It’s the one I’ve been eating since I was a kid! I have good memories nibbling these cookies around the holidays. I make them every year, kind of like a little tradition! Once the cookies are baked, you roll them twice in powdered sugar, making the sweet “snowy” coating. They’re a festive nod to winter weather, which is especially appropriate for us New Englanders! Luckily, these are the kinds of snowballs you won’t mind having inside. Bake a batch of Snowball Cookies for parties and gatherings this holiday season. You can even stack them in Mason jars to present as hostess gifts. 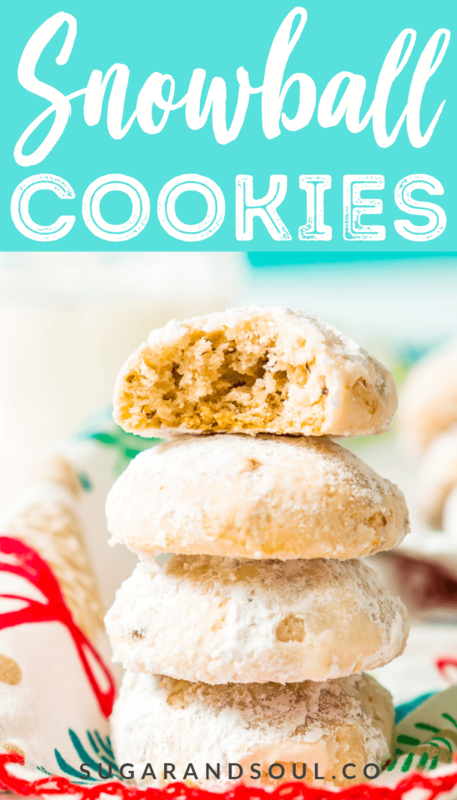 I also love baking this nostalgic recipe to contribute to Christmas Cookie swaps and exchanges. 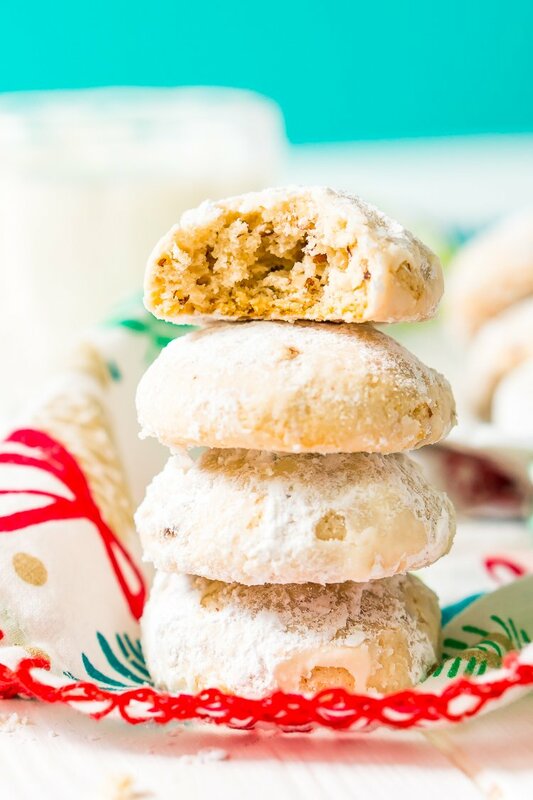 Snowball Cookies aren’t just for the winter, though. They’re perfect for wedding celebrations like showers, and they taste great when paired with tea. This should come as no surprise, considering some of the other names they go by! Make this Snowball Cookies Recipe to share and enjoy this holiday season. And don’t forget, these “snowballs” are perfect year-round for celebrations or to enjoy with your afternoon caffeine fix! What Do Snowball Cookies Taste Like? I think they taste a lot like Pecan Sandies. So basically a shortbread cookie laced with chopped nuts and dusted with sugar. Simply leave them out or replace them with mini chocolate chips or craisins that have been run through a food processor for a different flavor. Store them in an airtight container at room temperature for up to 4 weeks! That’s right, you can make these cookies well in advance and they will still be delicious! Bake the cookies as directed but DO NOT roll in powdered sugar. Freeze in a freezer bag. thaw at room temperature and roll in powder sugar once thawed. Preheat oven to 350 degrees F and line a baking sheet with parchment paper and set aside. Cream together the butter, vanilla, sugar, and salt and then add in the flour in two additions, mixing between each one. Beat until the mixture is fully combined. The dough will be crumbly at first but will come together, however, this is a drier dough than what you would expect from a sugar cookie, so don't be alarmed. Fold in the pecan pieces and use a small cookie scoop to measure out even dough balls, rolling them between your palms before placing them on the cookie sheet, giving each cookie 1 to 2-inch of space. Bake the cookies for 12 to 15 minutes or until the edges are golden brown, cookies should not be cracked. Remove from the oven and allow the cookies to rest on the baking sheet for a few additional minutes before rolling each of the cookies in powdered sugar and transferring them to a cooling rack to finish cooling. Once the cookies have finished cooling, gently roll them in powdered sugar again. Bake off all of the cookie dough until it's gone following this step. Store them in an airtight container at room temperature for up to 4 weeks! That's right, you can make these cookies well in advance and they will still be delicious!